The GM 215 cubic inch aluminum V8 engine (and its Rover descendants) have historically been the V8 of choice for MG conversions because of its light weight and compact dimensions. The engine was domestically available in a variety of 1961 to 1963 Buicks, Oldsmobiles, and Pontiacs and in several performance levels. Chart 1 illustrates the entire range of automobiles in which the aluminum V8 was available from GM and the stock performance ratings. 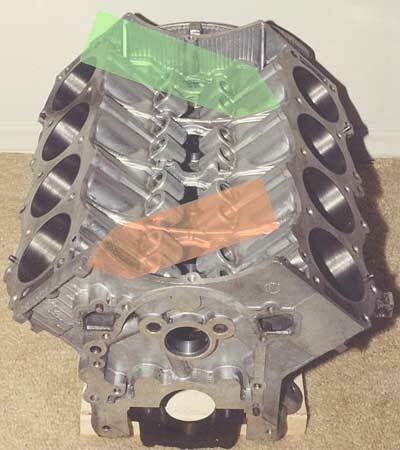 The chart can be of great benefit when shopping through the newspaper auto ads or canvassing wrecking yards trying to locate an engine as the owners often have no idea which version is in the car. A slight complication is that GM offered an optional higher performance engine in several of their models. For instance, the Buick Special could be ordered with an optional 185 H.P. engine rather than the standard 155 H.P. However, the vast majority of the autos were produced with the standard engine as listed in the chart. Also note that, judged strictly by horsepower, the best 215 seems to be the Olds Jetfire at 215 H.P. / 300 lbs torque. This engine was the first domestic turbocharged powerplant available to the public. (See turbocharger article in this issue.) The Jetfire engines are still available but the intake system is unsuitable for MG conversions as the turbocharger is quite bulky and rebuild parts are generally costly and rare. More often than not, when you do locate a 215 it will have been already removed from the car. Knowing the GM model from which the engine was originally installed can be helpful in determining history of the motor you are negotiating for. Chart 2 illustrates the engine I.D. system used by the three GM divisions for the aluminum 215. Note 1: Rochester carburetors were used on all models. Note 2: Either a three speed manual or a Hydro-Matic automatic transmission was included as standard-equipment in all model, but four speed manual transmissions were available as optional-equipment. "FFF" is numerical (meaning unknown). Photo by Curtis Jacobson, added with online publication. Information about Buick's supplemental engine codes added in June 2014. Copyright: text 1994, photo 2006. All rights reserved.